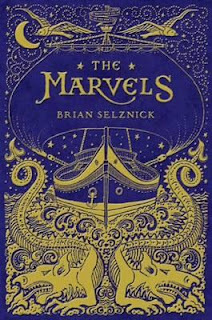 The Marvels is one of the most beautiful, satisfying and absorbing book I have had the pleasure reading in a long time. The unusual format - the first half is told entirely in pictures, the second in prose - was the first surprise and had me instantly hooked. Exquisite black and white illustrations fill the pages with such detail and life that I forgot I was not reading words. The occasional newspaper headlines or theatre bill helps keep this illusion while providing any additional detail such as dates and names. This illustrated first half tells the tale of Billy Marvel, the only survivor of a shipwreck in 1733, whose stories inspire the painting of the ceiling in a new theatre being built in London. Billy makes the theatre his life, and so too do the generations after him, until one year disaster strikes the lives of all. The second, seemingly unconnected, story is entirely told in prose. This tale takes place in 1990 when Joseph runs away from boarding school to take refuge in the home of his mysterious Uncle Albert. This house is the most astonishingly unconventional home Joseph has ever been inside and he is determined to get to the bottom of his Uncle’s strange behaviour. The shift from illustration to text is not as unsettling as I expected it to be. The prose is just as beautiful as the illustrations, providing imagery as effortlessly as the illustrations prove ‘words’. Also, by the time I had reached this midpoint, I was so involved as a reader that the change in form seemed a natural expression of the shift in the story’s focus. Reading The Marvels is a rich experience. Even holding the heavy hardback volume with its gold edged pages seems like the beginning of a journey. Go with it! Shipwrecks, high theatrical drama, family tradition and conflicts, this is a book to be savoured. Don’t let the size put you off. Once the pages are opened any reader will be enchanted, drawn into the story, and not want it to ever end. This is a marvellous read for those as young as nine or as old as ninety. 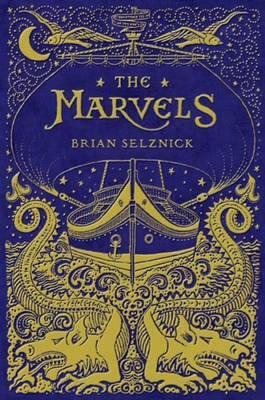 Brian Selznick is the bestselling author of The Invention of Hugo Caberet and Wonderstruck.